This book clocks in at 65 pages, 1 page front cover, 1 page editorial, 1 page ToC, 2 pages of SRD, leaving us with 60 pages of content, so let’s take a look! This review was sponsored by my patreons and moved up in my review-queue as a prioritized review. So, first of all: What is this? 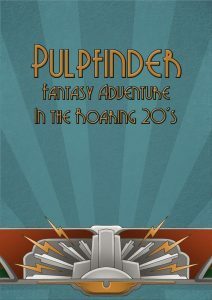 In short, it is intended as a toolkit to create Pathfinder campaigns that take place in the roaring 20s, blending fantasy and pulp – a strange combo, but one that very well may work rather well. There are some considerations for such a game – unlike more far-out settings, Pulpfinder per default assumes a human-only version of the game; so no, unlike e.g. Hydra Cooperative’s almost system-neutral (and really impressive) Weird Adventures, you won’t have a full-blown blending of classic fantasy tropes with pulp. The other deviation from the base system would be classes. Unnecessarily complicated metrics for equipment: 1 gp = $2. This will sooner or later really be annoying when converting. It’s not hard, but just another step to consider, which is, from a game-design-perspective, simply not required…and provides no benefit. A significant change, with everyone playing humans, would be that the book presents origins, serving the same purpose – they determine your attribute-modifications etc. The book does not clearly state whether this means that the standard human traits are not applied or not – while the answer is no, I think the book should have noted that in the start of the chapter. A total of 6 such origins are included…and they frankly don’t really constitute origins all the time – a bon vivant, to take the first example, doesn’t really say anything about that aspect…but that may be me. Anyways, the origins presented aren’t necessarily perfect: Take the bon vivant: +2 Cha and Int, -2 Wis, +4 to Diplomacy to influence NPC attitudes, +2 to Diplomacy and Sense Motive ( yep, that’s a total of +7 (+1 for the Cha-increase, +4 untyped bonus, +2 racial bonus) to influence NPC attitudes and +2 to saves to resist poisons, alcohol or drugs. In case you haven’t noticed, this is heavily lopsided and geared towards certain classes. This extends to most of the others: Hermetic Study guys and gals get +2 Int and Wis, -2 Str, +2 (unytped) to all knowledge skills, 2 languages per rank of Linguistics and +2 to Will saves. Wildman get +2 Con and Wis, -2 Cha, +2 to AC when in a chosen terrain, +2 to Knowledge (nature) and Survival and +2 to initiative. Working Class folks get +2 Str and Con, -2 Int, +2 to all Profession and Craft skills (obviously, working class folks make the best lawyers, doctors, etc.) and +2 to Fort-saves as well as the option to continue fighting for 1 more round after being reduced below 0 hp, but not killed. Career criminals get +2 Dex and Cha, -2 Con, +1 to all saving throws, +2 to Escape Artist and Stealth and +2 to Perception. Finally, cosmopolitans (annoyingly referred to as „world travellers“ by the book, which may mean almost the same, but still irks me…) get the bonus feat, +2 to an attribute of choice and +1 skill per level. As a whole, it is pretty clear that the origins all are geared towards specific classes and options. They, to me, are not really origins in the sense of the word, but more problematic would be that they, ultimate don’t really provide a nuanced array of options, instead very clearly gearing them to specific pursuits. This is a pity – for, as mentioned in my reviews of Xoth material, I do enjoy the notion of not using races to determine these types of rules. As presented, I am definitely not impressed. Anyways, the next section depicts the cadre of classes and oddly switches layout style from a two-column-presentation to a 1-column-presentation.The classes generally fill a similar niche as those in the base class roster, though a scaling AC-bonus is baked into every one of the classes. This bonus varies by class, scales…and is only defined for the first class, as working only while unarmored and unencumbered, none of the other classes have a concise definition for this in the respective entry. The fact that the bonus only applies while unarmored and unencumbered is weird, considering the armor-proficiencies gained by characters. It also means that the math isn’t coming together too well at mid and high levels and enhances the importance of Strength – without it, your AC is not going to cut it as soon as you need to carry basically…anything substantial. The classes, in all brevity, would be: The soldier, who gets full ABB-progression, 2 + Int skills per level, d10 HD, good Fort-saves and basically gains the gunslinger’s deeds plus weapon training a bunch of bonus feats. This would be, btw., as well a place as any to note that firearms act as martial weapons (oddly, armor proficiencies tend to be capitalized in a violation of formatting conventions). Firearms are reloaded as a move action, which botches interaction with the rapid reload feat, which explicitly states how it affects firearms. Oddly, firearms still suffer from misfire. While we’re at the subject – yes, there are rules for scattershots and automatic fire, both of which are very potent, ignoring e.g. concealment in the latter case. Also, strangely, line of effect does not feature in the rules-language, which may be a reason why these are so potent…and which can explain for some of the issues that can crop up here. A barebones feat for Mad Science (duplicating spell-lists for item creation) and 3 minimalist new skills (forget skill unlocks etc.) can be found. The weapon table of available items only covers one page, and most of the content has been presented before. Fun fact: Flame throwers inflict RAW untyped damage, unless they explode – then they suddenly inflict fire damage. The 4 armor types are pretty inadequate and their presentation ignores several formatting convention. The section contains notes on lifestyle costs, mad science services (i.e. duplicating spell effects) and the like – and it contains detailed vehicle rules, with various different cars – the fact that this presents these cars and vehicles in a concise and easy to grasp manner helps big time here and makes this constitute the first aspect of the pdf that actually has something to offer for me. In fact, oddly, once the pdf stops duplicating basically copies and recombinations of previously published material, it begins being pretty much…interesting! The spell section has some really creative ideas: Using a spell to make an undead car? Broadcasting your thoughts via radio waves? There are some seriously cool and creative ideas here. I wish this brief chapter and the notes on existing spells were longer. The pdf also features two alas, uninspired PrCs – the mad scientist at 10 levels and the 5-level private detective, both of which are utterly unremarkable. The pdf also offers a very brief and sketchy “The City” sample setting, which is nowhere near enough the level of detail where it’d make sense and the advice for pulp gaming is decent. I did enjoy the brief list of slang and the further research notes, though. Editing and formatting are weird: Due to the amount of content that was just copied and pasted and recombined, it is better than what you’d expect, but nowhere near as precise as it should be, with hiccups cropping up here and there. Layout adheres to a 1-column or 2-column standard – not sure why the pdf alternates there. The best aspect here would be the really cool b/w-artworks throughout the book, which are really, really nice. The pdf does not have any bookmarks, which represents an inexcusable comfort detriment for a rules-book of this size. Charles Smith’s passion for pulp is evident. However, at the same time, this book doesn’t really succeed at what it sets out to do. From a crunch perspective, this is too brief and all of its classes are boring variants that are pretty much the epitome of bland filler. They would have been bad back in 2010, but nowadays? No dice. I don’t get why we needed these, considering that, frankly, they are not internally consistently balanced and don’t bring anything new to the table. They are wasted space. The origins are problematic as well. The scarce setting information doesn’t really help that much to endear this book to the reader either. Unfortunately, this means that there is no reason to get this book. There is literally nothing positive I can say about the book at hand as a whole; a few creative ideas buried in a ton of redundant filler does not make for a compelling book. While the craftsmanship formally isn’t bad, even the by now not too gracefully aged Xcrawl classes make for better options. More than half the pages of this book are useless, boring, bad variants (or straight reskins) and the lack of pages due to them clogging the pdf is evident everywhere. They btw. Lack FCOs. There are no traits or alternate origin traits. And yes, playtest did show that the material plays just like I figured they would. In short: I can’t really picture any scenario when this would be worth getting. Anachronistic Adventurers is infinitely better and the base system has a ton more to offer. While the craftsmanship is not bad per se, it’s also not excellent, showing a lack of experience with the more intricate components of design-work. In the end, I can’t really go higher than 2 stars for this pdf – it does not deserve a 1.5 rating for its craftsmanship, but it is pretty much obsolete and doesn’t have much to offer. You can get this booklet here on OBS!